Last Sunday I spent the afternoon playing DASL1 The Schoolhouse. I was thankfully partnered up with an experienced ASL’r, Simon, as the Russians. This engagement took place on July 9 1943 at a Russian village at the Kursk salient called Ponyri. The scenario card described this as “the most intense street fighting since Stalingrad“. This engagement also saw the huge Ferdinand tank destroyer (aka “Elefant “or “Porsche Tiger”) in action. I got to say : this is a VERY interesting scenario. The Germans (Lawrence, Erwin & Wah) had limited time before a whole new Russian army piled in. On one hand they needed to be aggressive as they were under time pressure, although they couldn’t be too aggressive as they had to be able to fall back to proper defensive positions when the Russian counterattack arrived. My partner Simon did a terrific job defending the stone building (marked in yellow) to the immediate north of the intersection on board d. His use of tunnels (one of them marked with yellow dotted line) to the two buildings behind (forfeited fortified buildings) as rout paths and to gain concealment was a beautiful thing to see. Too bad the Germans lost their flamethrower early in the game!! The Russian defence involved the use of set demolition charges as well. The Russians fell back when necessary but did everything to delay the Germans until the counterattack arrived. One of the Elephants was torched with Molotov Cocktails when it tried to rush a killer stack. Two of the remaining three Elephants were immobilized but were in great positions. It didn’t look easy for the counterattacking Russian tanks if they want to hit back through the narrow streets. The Germans tried rushing the street (marked with the wavy red line) in front of the stone building but was wiped out by spraying fire. At one point the Germans got that stone building encircled, rush the ground floor and was in the process of destroying one end of the tunnels. That was precisely when the counterattack showed on Turn 7 (marked with the blue arrow). The lead tanks and the elite troopers of the 1st Battalion 1032nd Rifles helped defend the tunnels together with the 307th Rifles coming back through. I had to run at that point but my friends told me there was a human wave on the German’s left flank and Germans conceded on Turn 8. 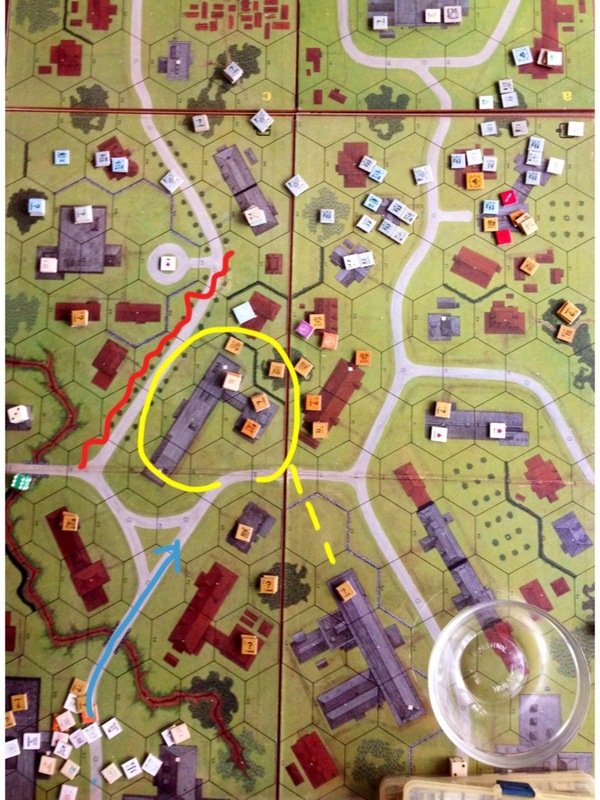 This entry was posted in Game Play and tagged AAR, Advanced Squad Leader, ASL, Board Game, board wargame, German, Hong Kong, Kursk, Ponyri, Russian, Scenario, Stalingrad, wargame. Bookmark the permalink.